We have had a steady stream of visitors over the last few weeks, with more to come before year’s end. 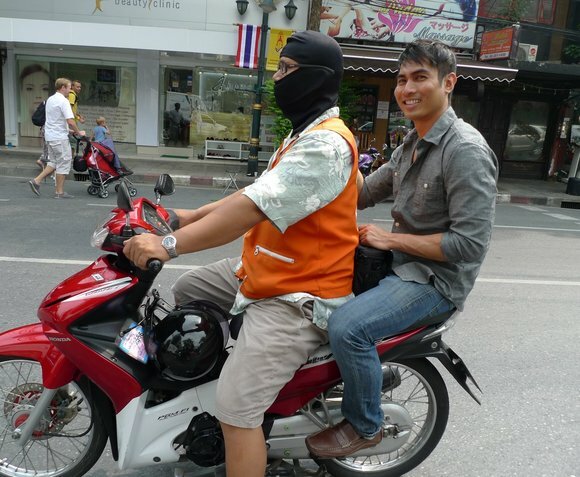 I took an afternoon to accompany one of our guests to the old part of the city, Rattanakosin Island. When I have guests, I try to show them more than just the typical tourist’s view of the city, even when going to see the popular tourist sights. To be a good host, you have to know just how much excitement your guests can handle. In this case, I figured Jordan could handle a ride down the city streets on the back of a motorcycle taxi. Maybe I should have set expectations ahead of time, as I think he was a bit shocked when we first set off. After a ride on the Khlong Saen Saeb canal boat and a connection to a tuk-tuk, we arrived at the Grand Palace and Temple of the Emerald Buddha. This is the must-see tourist site, the most important temple in Thailand and one of the most spectacular examples of the overwhelming decoration of Thai religious architecture. But it is tourist high season and the complex was flooded with tour groups. I tried to work around the outside of the complex, looking for angles and vantage points that were free of tourists and that allowed for greater appreciation of the ornate beauty of the temple. 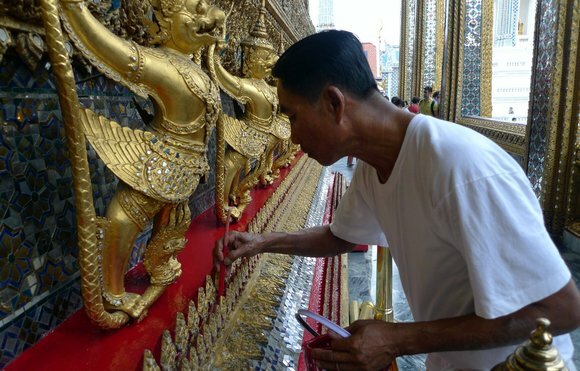 This shot, taken on the side of the main hall which houses the Emerald Buddha, shows a worker applying a new coat of paint to the base of the building. The paint was a brilliant shade of red and the man worked with slow, methodical strokes of his brush. His activity seemed almost meditative. A short walk away is Wat Pho, the Temple of the Reclining Buddha. 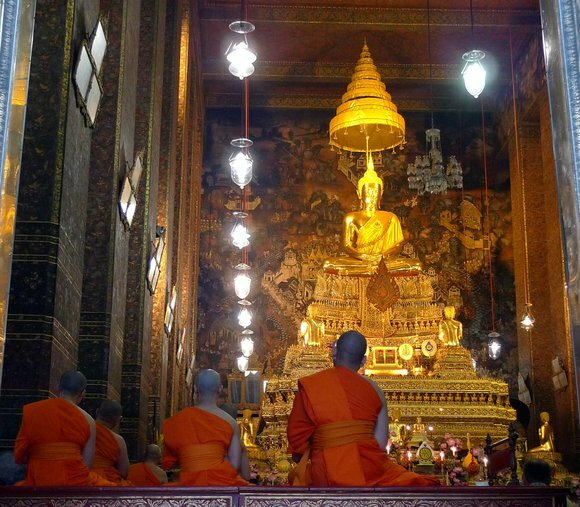 This is another popular tourist spot, but most tourists just walk into the main hall with its huge image of the reclining Buddha, and then leave. The temple complex, which predates the founding of Bangkok, is much larger than one might think and is worth exploring. In the back section of the temple is a large Buddha image hall that I find more impressive than the Temple of the Emerald Buddha. As we were sitting there, admiring the detail, an older monk arrived. He prayed in silence for several minutes and then after the grandfather clock struck 5:00, he flipped a switch, illuminating the statues. Other monks had trickled in and they began their evening prayers, beautiful chants in the Pali language that echoed off the mural-covered walls. As the sun set into the muddy horizon, we wandered around the rest of the nearly-deserted temple complex. 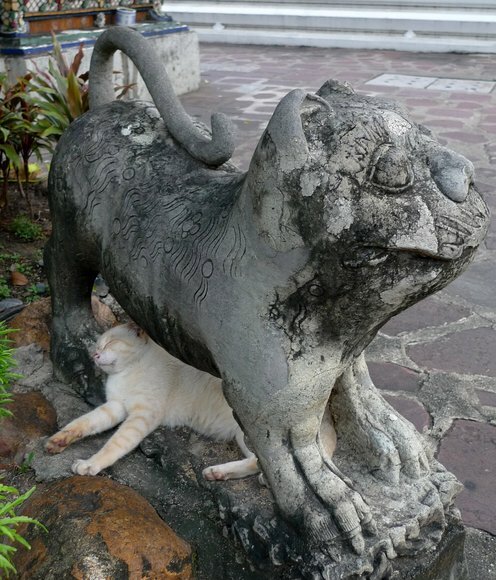 A white cat napped beneath the legs of an old statue of a Chinese lion. A few tourists wandered by, looking for the massage school located on the temple grounds. It was a very different experience than the one you get in the usual rush to see the sights. Hopefully, it was memorable. This entry was posted in Uncategorized and tagged Bangkok, Krungthep, temples, Thailand, travel by christao408. Bookmark the permalink. I smiled at the cat reclining… typical cat behavior, to sleep *anywhere*. Beautiful photos… but some of your work as of late prompts me to ask: I never knew – why do the priests wear orange, specifically? What’s the symbolism? How peaceful just to even read about the way the monks were chanting in the temple. I can totally visualize that. Is Shawn helpful in what occurs in Buddhist temples or he just leaves it up to you to learn?I was surprised that in some Prisons a Buddhist missionary can come in a perform a Buddhist ceremony like the watering of Buddha. The massage school is still in the temple grounds? I wonder where you would take me if I visited Bangkok. 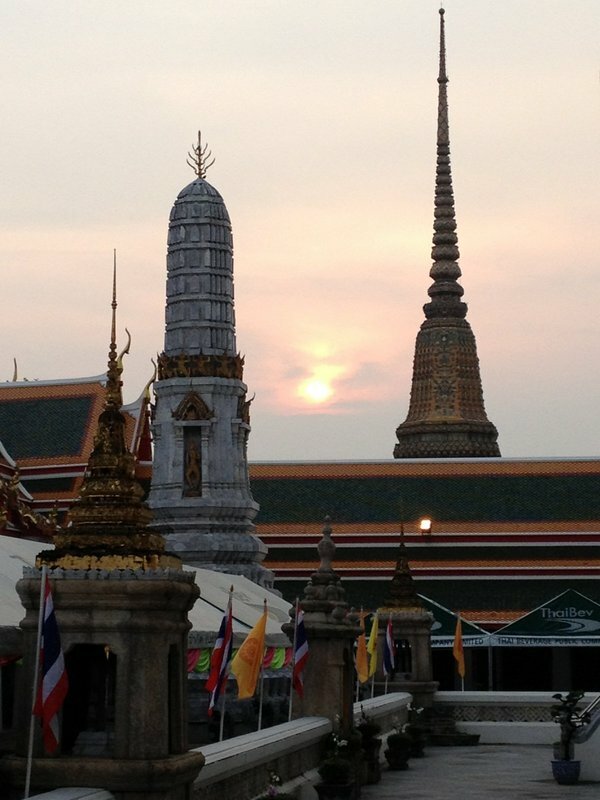 The Grand Palace and Temple of the Emerald Buddha, Wat Pho-The Temple of the reclining Buddha are amazing. I have heard the Monks singing chants on you tube videos and it is such a soul touching sound.Love the photos of the white cat napping under the old Chinese lion statue, and maybe the kitty sees himself as a lion.Have a great rest of the week that is flying by way to fast. It’s definitely on my bucket list to visit the temples one day (and hopefully soon). Looks so beautiful.